CLAIRE CURNEEN STARTS EACH of her sculptural ceramic works in the same way, with a small piece of clay. Squeezing it between her fingers, pushing and pressing it into the palm of her hand, she flattens it into a small disc. These discs are the building blocks of her figures. By pressing and squeezing them together, she begins to construct a hollow form in much the same way a potter will build up a coiled bowl. She starts with the feet, slowly adding layers of clay, making sure that those at the bottom are slightly thicker, to take the sculpture’s weight. As she makes her way up from legs to torso and neck, the clay becomes thinner, the process faster. Finally, she crowns the head with a thin disc of clay, smoothing it until the seams disappear. 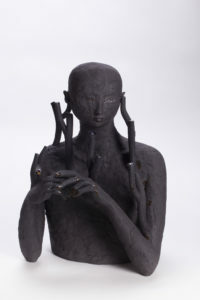 Curneen loses herself in the meditative repetition of this initial phase, achieving a haptic familiarity with each figure as she feels the clay through her fingers and her fingers through the clay. When the basic form is complete, she starts on the details, introducing delicate facial features and spending time on the hands and fingers, making subtle adjustments to their position. Should they point? Hang limply at the sides? Be open and inviting or gently cradling? While ancient sculptors believed that it was the final act of painting in the eyes that gave their work life, in Curneen’s case it is this final positioning of the hands that animates her forms, giving them individuality and expressing their particular emotions, narrative, and character. This is painstaking, repetitive work that demands consummate skill. Even the simplest figure takes two weeks to finish. Others, like those shrouded in delicate rosebuds, take almost twice as long. 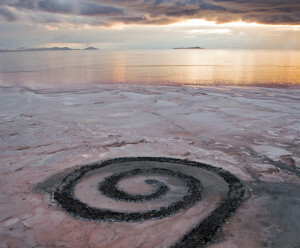 But eventually the basic construction is complete, and Curneen can begin the complex process of firing. 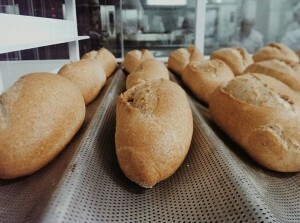 In the first stage, the biscuit fire, the kiln reaches a temperature of a thousand degrees centigrade, which turns the soft clay into hard ceramic, robust enough for the next step. She places the sculpture into the kiln and waits. When the sculpture emerges, after seven hours of firing and seven more of cooling down, it is ready for the glazes and decals to be applied. Occasionally Curneen will dip the whole sculpture into the glaze, leaving it wrapped in viscous liquid that clings to the surface and pools in its crevices. Usually, however, she applies glaze sparingly, brushing it onto joints and using it to accentuate highly modeled areas such as hands, feet, and faces—the places where the human body experiences the outside world most intensely. She might also apply a set of decals, wrapping the figure in a bouquet of luxuriant blue flowers. Once decorated, the sculpture goes into the kiln again, this time at 1280 degrees centigrade. It is this high firing that causes the clay to vitrify and transform into translucent porcelain. Again, she waits. Curneen has been waiting by kilns for more than thirty years, since her foundation year at Crawford College of Art and Design in Cork, Ireland. Although she always knew she wanted to make figurative images, Curneen, like many foundation-level students, didn’t know how she wanted to make them. But then she entered the college’s ceramic studio and immediately felt at home amid the smell and dust, the different glazes and technologies. She was attracted to clay’s materiality and hands-on physicality, and fascinated by the technical processes required to turn clay into ceramic and the different ways it could be decorated. She decided clay would be her material. Her first clay sculptures were large, observational pieces depicting groups of gregarious girls enjoying nights out. She continued these ceramic conversation pieces during her undergraduate degree at Cork, and when she moved to Belfast to continue with postgraduate studies. In 1991, she left Ireland to study for a master’s degree at the Cardiff Institute of Higher Education in Wales, where she discovered porcelain. Porcelain has a translucence and impermeability that makes it very different from other ceramics. It holds and radiates light rather than absorbing it, as more granular stoneware can. Curneen knew she wanted to work with it, but she also knew that the bold sculptural statements she had been making previously wouldn’t work. Porcelain presents too many technical challenges to work on a large scale. She began making individual figures instead. These were smaller and more introverted than her previous groups, with more delicate features and less overtly dramatic gestures, better suited to this more luminous material. PLATE 1. Claire Curneen. 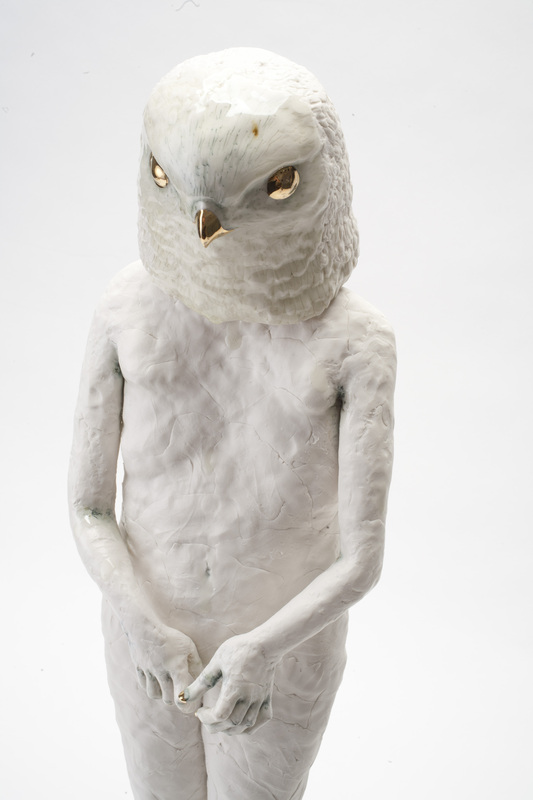 Bird Figure, 2013. Porcelain. 23 1/2 inches high. All photos: Dewi Tannatt Lloyd. 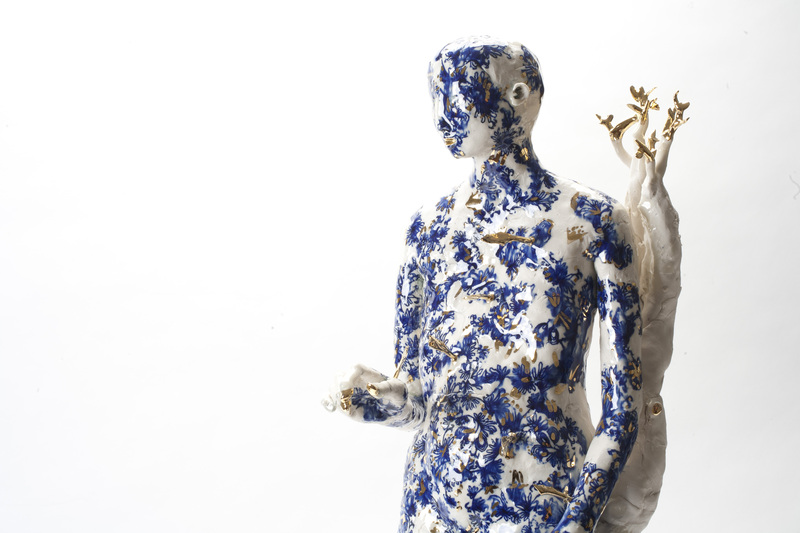 As Curneen explored porcelain’s potential, she found herself able to tackle subjects she wouldn’t have otherwise considered. A heart wrapped in delicate rosebuds, if made out of stoneware, a material she still uses, would somehow feel too dense and heavy, whereas porcelain’s shifting delicacy makes this an image of elegiac beauty. Similarly, porcelain’s malleability allows her to create sheets so thin they can appear almost transparent. From these she deftly rolls twigs to create bundles of kindling she hangs from walls, and constructs tangled nests for small birds who fill them with a ghostly presence. 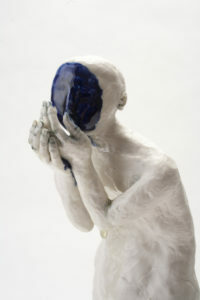 Her ability to manipulate incredibly thin sheets of porcelain in the palm of her hand has also allowed her to model hollow bird-head masks for figures. Like Egyptian gods—half man, half beast—they occupy a liminal space where the distinctions between divine, human, and animal are blurred [see Plate 1]. Throughout her career, however, the human figure has always remained central. Again and again she returns to the same familiar tropes: men, women, angels, and saints; sometimes full length, sometimes busts. Some have been pierced by arrows; others have sprouted wings or branches. Most are porcelain, but occasionally they are charcoal-colored stoneware flecked with tiny fragments of vitreous material [see Plate 2]. Each time, the process remains the same: she places the figure in the kiln and waits. The figures that emerge are enigmatic, haunting, and evocative, their flesh turned into liquid light by the vitrification of the clay. Frequently standing in the gentle, contrapuntal attitude of the Decorated Gothic period, they seem to have been disturbed in a moment of private contemplation, caught unawares, frozen mid-narrative, when anything might happen but hasn’t yet. With subtly modeled features that are uniform rather than individual, they are everyman and everywoman, exuding a gentle gravitas that suggests both openness and interiority, strength and vulnerability. 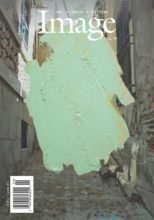 She had…denied that her work made an issue of the female body, when it clearly did; her reticence stemming from her fear of “being branded as an artist who deals with feminist issues.” Eventually she accepted that her early figures were about womanhood, and today she frequently refers to her work within the context of the feminine. PLATE 2. Claire Curneen. Builders (detail), 2013. Black stoneware. 30 inches high. Certainly her figures have a superficial appearance of a gender neutrality that tends towards the feminine, with male and female faces frequently indistinguishable, but her Saint Sebastians and other male figures are clearly anatomically male. Curneen’s interest is not so much the female body or the experience of being a woman, but rather those qualities such as love, care, gentleness, and compassion which have been traditionally seen as feminine, and these are sensibilities that all her figures express, male and female. They stand openly rather than defensively, are rounded rather than angular, at one with nature rather than in competition. Curneen’s figures reclaim these qualities from the silos of specific gender attribution and celebrate them as broadly human, offering images of love and universal interconnection that are expressed by both men and women. Curneen’s desire to give visual expression to traditionally feminine qualities led her to revisit the Christian iconography of her childhood in Ireland. Although she is no longer a practicing Catholic, the imagery and practices she experienced growing up, particularly devotion to the Virgin Mary and appeals for the intercession of the saints, are still deeply embedded in her psyche, and faith is still, as she says, an itch she feels compelled to scratch. 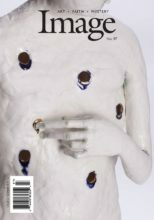 Her studio wall is covered with reproductions of Renaissance religious paintings, whose subjects provide her with inspiration as she squeezes and sculpts her discs of clay into human forms. Familiar from both her Catholic youth and her art studies, the images provide her with exemplars of the very same virtues she wants her own figures to convey, and a reminder of how earlier artists often used nothing more than simple poses and gestures and saintly attributes to convey these sensibilities. When looking for a pose for one of her own figures, she might turn to an image of the Virgin kneeling with humble strength before Gabriel, or a contrite Mary Magdalene, her face raised to heaven, or the relaxed stance and upward gaze of Sebastian, who tranquilly accepts his painful death. At the center of Curneen’s cloud of painterly witnesses is a color postcard of Piero Della Francesca’s Baptism of Christ (1448–50). The central figure’s porcelain-like luminosity and calm stillness has long been a significant source of inspiration. She is constantly intrigued by it, fascinated by Piero’s ability to suggest intense drama despite an atmosphere of absolute calm. From it Curneen has learned the art of visual subtlety and the ability to create images of restraint rather than excess. PLATE 3. Claire Curneen. Blanket, 2013. Porcelain, nylon, and cotton. 22 3/4 x 15 inches. During the winter of 1999–2000, Curneen undertook a three-month residency at the Crawford Arts Centre at the University of Saint Andrews in Scotland, which proved to be a pivotal moment in her career. 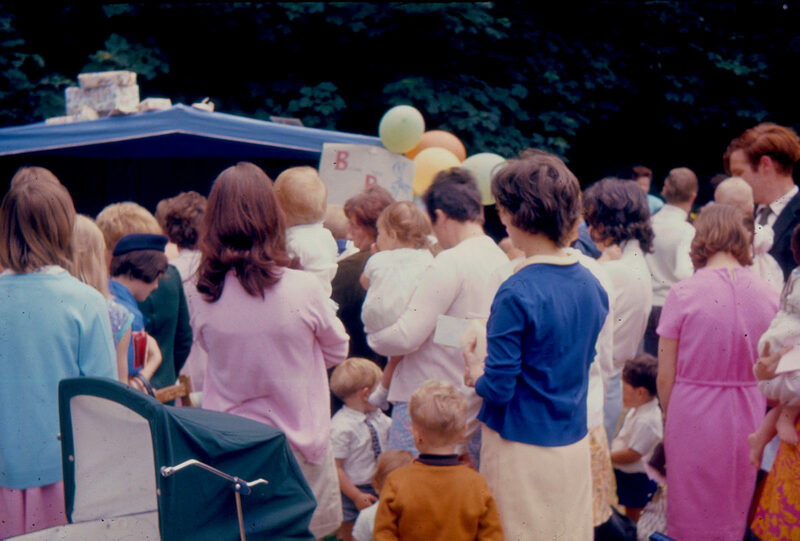 She used this time to focus on images of martyrdom familiar from her childhood devotions. She was particularly drawn to Saint Sebastian, a third-century Roman martyred during the reign of Diocletian, traditionally shown tied to a tree and shot with arrows. What fascinated Curneen was the essential dichotomy she found in these images. “I am interested in the narrative portrayed,” she has said, “the extreme physical suffering, contradicted by the ease with which he accepts his fate.” In Latin this dichotomy finds expression in the single word passio, which hints at both suffering and forbearance, action and passivity—the same feeling of ambiguity Curneen wanted her own work to convey. Over the years Sebastian has become a recurring figure, sometimes pierced by small arrows that are barely present, sometimes with shafts so large that they threaten to topple him over [see Plate 4]. She has shown him stood in front of a stylized tree sprouting golden buds, and also isolated, with nothing to protect him. Regardless of these subtle differences, he always faces the viewer with a look of quiet, beatific fervor, seemingly oblivious to his wounds and the arrows that bristle from his body. Saint Sebastian and Saint Catherine provided Curneen with obvious images of martyrdom, but she also approached the subject in other, less expected ways. Following the Crawford residency she began work on a series of small hands clasped tightly together. They instantly suggest intercession, pleading, or meek acceptance: perhaps the martyrs’ faithful prayers uttered in the face of death. But these are not just symbols of pious devotion; they are also evocations of torture and violence, with pools of golden blood flowing from severed joints or skeins of red wool forming arterial spurts. Their antecedents are the Baroque images of martyrdom, where ultra-realistic depictions of bloodstained, pierced, and wounded figures are used to emphasize the power of unwavering faith. They also relate to the collections of realistic severed limbs left hanging as votive offerings at healing wells, where the intention may be to express hope for healing, but the effect can often be bizarre and unsettling. Yet Curneen replaces these gruesome scenes with her own sense of delicacy and restrained minimalism, reminding us that what is expressed through a dramatic and realistic grand narrative can just as powerfully be conveyed by something small and otherwise overlooked. PLATE 4. Claire Curneen. Over My Dead Body (Saint Sebastian), 2013. Porcelain. 29 1/2 inches high. We find the same tangential approach in a series of drawings and sculptures Curneen made at Crawford in which she focused on the instruments of the Passion. In these simplified, symbolic renderings of the saw, hammer, pliers, and pincers used to build the cross, nail Christ to it, and then take him down from it, Curneen again focused on their implicit ambiguity: these objects both make and destroy; they bring death and yet are symbols of ultimate hope. Curneen has always made delicate line drawings, which allow her to explore ideas that she might later develop in her sculptures. Her drawings of the instruments of the Passion were different, however. They were not about describing the specific design of each tool, but about discovering their mass. Presence is conveyed through absence, their individual forms represented by a densely drawn accumulation of dark graphite marks that form a void in the center of the paper. The sculptures, deliberately made too small for practical use, also declare presence through absence, this time through the bristling layer of small clay cones with which Curneen has painstakingly covered their surfaces. Like an old wreck covered with submarine accretions, their edges have been broken down into constantly shifting borders. The original shapes have disappeared and been reformed. Once again, Curneen celebrates the ambiguity of her subjects, blurring boundaries between functional and aesthetic, hard and soft, beauty and pain. One of the prints on her studio wall is a slightly faded image of a hand with black fingertips and a stain of red on the wrist. From a distance it might be appear to be a detail from a painting of Christ’s hand extended on the cross, but it is in fact a photograph from Andres Serrano’s Morgue series. The victim’s skin has taken on the yellowy-gray pallor of death, while the fingers glisten with fingerprinting ink, their black tips merging into the dark background of the image. A rich scarlet snail-trail of blood emerges from a wound on the wrist, providing a macabre tattoo for the arm. It is a striking image, whose influence on Curneen appears not only in its obvious relationship with the praying hands but throughout her work. PLATE 5. Claire Curneen. Blue (detail), 2013. Porcelain. 19 1/4 inches high. When Curneen first saw this image, like many, she was distressed by its sense of bleakness and horror, and its matter-of-fact depiction of an anonymous corpse. The black stain at the fingertips suggests disease and decay, hinting at something ominous and the risk of contagion. Yet Curneen also found something very beautiful in the image, with its contrast in textures and colors and its suggestion of a mysterious narrative. Mesmerized by what we see, we cannot help but ask, who is this corpse? Were they male or female? What have they done? How have they died? Where Piero’s baptism offers drama through stillness, Serrano creates a complex narrative through nothing more than a hand. 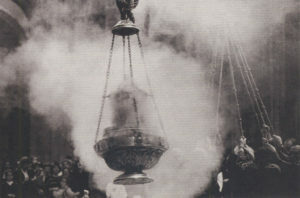 Together, the two images represent the conditions that Curneen is constantly striving for: complex drama achieved through stillness and simplicity. The black fingertips remind Curneen of her time in art college, where you could tell what a person was studying by their fingers. The printmaker had black hands, while the potter’s were covered in white dust. Today, her own hands are stained pale gray by the sustained action of her fingertips: pinching, squeezing, and pressing clay into her palms. The hands of Curneen’s figures, however, have been dipped in liquid gold. If black suggests something ominous, then gold suggests the opposite: it is the color of haloes and the gilded backgrounds of illuminated manuscripts and gothic altarpieces, a universal indication of the divine and otherness. But Curneen’s figures don’t just have golden fingertips, they also have gold blood, which rings the wounds of Saint Sebastian and Saint Catherine and leaves gilded trails down their flesh, allowing us to glimpse an interior that is not corporeal and visceral but precious and luminous. We find the same golden blood flowing from the praying hands in Spill (2003) and forming a pool in the center of Crown (2003), where praying hands have been shaped into a circle of intercessory hope. Indications of internal states of transformation or transfiguration are not confined to gold, however. Recently Curneen has begun to use a deep blue to create a similar effect. Like ultramarine, which was reserved for only the most significant parts of medieval paintings, this blue glaze is used only sparingly, painted onto faces, hands, and other areas where it will have the maximum impact [see Plate 5]. The effect is dramatic, with faces dissolving into an incorporeal void. For unlike gold, which reflects light, this deep blue holds light, absorbing our gaze into its pellucid depths. Curneen exploited this difference in one of her most recent works, Empty Tomb (2018), where blue and gold ooze from a series of gaping wounds, like the unmingled blood and water that flowed from the side of the dead Christ [see front cover]. With the tip of one finger, this elegiac figure gently points out one of these openings, echoing Saint Thomas, who needed to touch Jesus’s wounded side before he could believe. This gesture is the only moment of animation in a work that is otherwise still, but it is not the focus. That is to be found in the wounds themselves, which stand out starkly against the limpid porcelain. These are the empty tomb of the title, apertures exuding blue and gold, dark and light. They draw us in so that we find our attention focused entirely on these small rings. For a moment, as we teeter on this visual precipice, with solidity melting around us and the figure dissolving into the background, time stands still. PLATE 6. Claire Curneen. Tending the Fires (detail), 2016. Porcelain. 15 3/4 x 90 1/2 x 19 1/2 inches. Curneen uses gold to suggest multiple layers of history, meaning, and association. But she also uses it to break down solidity, exploiting its reflective properties so that our eyes are dazzled and the surface dissolves. She achieves the same mesmerizing effect using printed blue and white flower decals that she first found in the potteries of Stoke-on-Trent in Staffordshire and now obtains from China. Initially these floral patterns were used on mass-produced crockery, even chamber pots, while gold luster was used to form a neat trim around the rims of fine bone china cups and plates. They were utilitarian and ordinary materials. But Curneen has turned gold into a sacred stain on the edge of fingers and leaves, while blue and white flowers provide the flesh of saints, angels, and nymphs. What was once considered mundane and ordinary has become transcendent, mysterious, and marvelous. 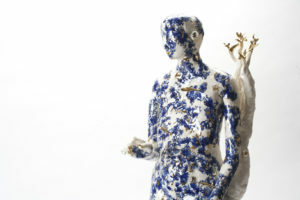 As they run rampant across many of her works, the floral patterns provide a distinctive tattoo behind which the porcelain figure seems to disappear. Sometimes she will confine them to just a few areas; sometimes she covers a figure from head to toe in their delicate camouflage; and occasionally they defy the figure’s boundaries completely, covering the base as well. Curneen is drawn to this sense of fluid identity. Not only does it echo what happens in the high firing process, when vitrification can cause porcelain to twist, decorations to slip, and colors to gently bleed and move across the surface, it also reflects Curneen’s own interest in fluid borders and hidden, uncertain forms. Painted decoration offers Curneen one way to dissolve her surface, but she also employs other means of formal dissimulation. In addition to the strange clay spines that covered the instruments of the Passion and the arrows that protrude from Saint Sebastian, she has at times covered figures with tightly formed rosebuds, leaving only their faces and bare shoulders free. Where the blue-patterned decals provide a surface decoration, these roses physically change a woman’s form, creating a chrysalis that both hides her and suggests the development of something new. 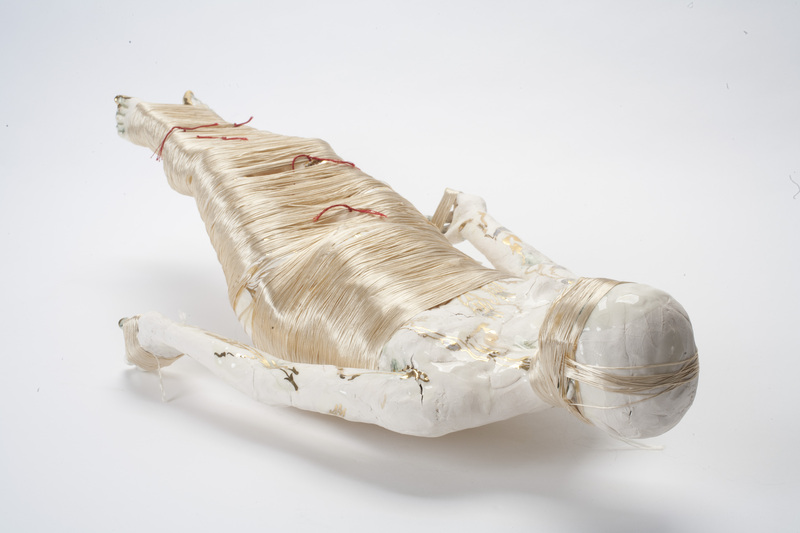 Another form of cocoon can be found in Blanket (2013), in which Curneen wrapped a recumbent figure in golden twine that binds her body, hands, and face [see Plate 3]. Although she is not completely covered by this shimmering shroud, her supine form largely remains a mystery, only hinted at, never fully revealed. But this is what Curneen always intends; she wants to visually tease us, offering us edges that appear and disappear, narrative hints that are never developed, men with the heads of birds, forms that appear simple but are actually complex, sculptures whose porcelain flesh seems to rustle like leaves in the wind and murmur like running water. PLATE 7. Claire Curneen. Daphne, 2014. Black stoneware. 21 1/2 inches high. Curneen is constantly breaking down the formal borders of her sculptures, defying outlines and hard edges through reflected light and bristling shapes, but some of these acts of formal destruction also reveal her vision of an interconnected world. Perhaps unsurprisingly for someone whose skin is constantly in touch with another material, Curneen is often drawn to subjects of transformation and interconnection, particularly Ovid’s account of the naiad Daphne, who is turned into a tree as she flees the god Apollo. As branches bleeding golden sap sprout from her body, Curneen’s black stoneware bust of Daphne (2014) has the same look of calm resignation to her fate as Curneen’s martyrs [see Plate 7]. She similarly presents an ambiguous figure, neither one thing nor another—neither tree, nor human, nor goddess, but something in between, occupying that liminal border that Curneen is constantly drawn to. Falling Slowly (2003) depicts another woman overrun by foliage, although in this case the foliage is a decal that has grown up her chest and wrapped itself around her arm. 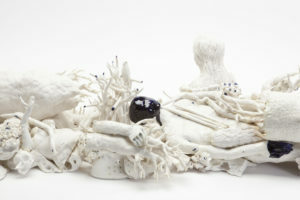 With her porcelain body almost invisible beneath this surface decoration, she seems to be drowning in nature, caught up in a similar moment of blissful transfiguration and natural interconnection to Daphne. 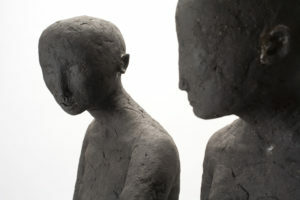 Whenever Curneen stands outside the kiln, waiting for her sculptures to cool down after their high firing, it is as much a moment of concern as hopeful anticipation. After all the hours and days spent working on a figure, there is always the possibility that she may open the door and find that a work has developed an enormous crack or, on some occasions, shattered completely. The waiting is a state of being that all ceramicists must learn. It’s not just about biding time until the firing is done, but the ability to step back, let go, and accept, to move into a passive state after all the action. A sculptor must accept that her work can only be completed by processes of heat and fire over which she has no final control. Curneen never throws any of the broken shards away. They are arranged at random in her studio: broken hands next to shattered flowers, a head next to a broken arm. Like the postcards she pins to her studio wall, they are a reminder of the need to accept, wait, and let go. But more importantly, they are a reminder of beauty in brokenness. Inevitably, having spent days and weeks pressing, feeling, and holding the clay, she can never see these shards as broken misfires; she will always see their potential and find in them a moment of beauty. Over the years of looking at them, she also began to see the potential for something larger. 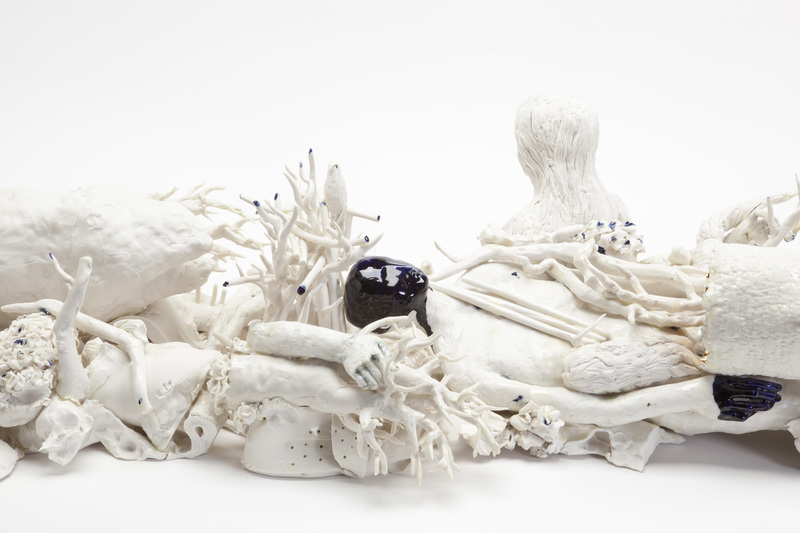 So in 2017 at the Harley Gallery, Nottinghamshire, she brought together these broken parts, along with some specially made pieces, to create a porcelain world, Tending the Fires [see Plate 6]. There is no specific narrative, no particular focus, no sense of hierarchy, just a reflection in porcelain of this world: broken, partial, shattered, beautiful, chaotic, human, natural, abstract, and figurative, yet always wonderful. It is in so many ways the complete opposite of what Curneen has always striven for: complex rather than simple, dramatic rather than quiet. But as Curneen discovered when she first began to work in porcelain, this is a material that can hold light and exude quiet. Tending the Fires might have a rare visual complexity, but the tranquil uniformity of the white porcelain envelops the whole in a blanket of stillness punctuated by moments of blue and gold that hint at the presence of something other. This is why Curneen is still working with porcelain almost thirty years after she first discovered it: it allows her to explore those ambiguous boundaries and loving sensibilities where mystery encounters the mundane, wonder is found in the ordinary, and pain discovers peace and hope.